Web application single sign-on (SSO) has been an important part of the identity and access management (IAM) ecosystem over the last decade. In fact, web app SSO may have been the hottest segment in the identity and access management space over that time period, continuing with that momentum even into today. 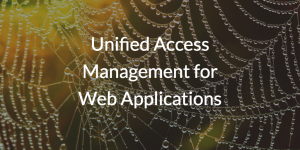 But now, many analysts and vendors have taken to calling it unified access management for web applications. So, why the name change? Let’s find out. Well, IT organizations are learning that the patchwork of IAM solutions isn’t cutting it. Using legacy systems for directories, such as Microsoft® Active Directory®, in combination with web-app SSO and other add-on solutions has proven to be very cumbersome. So, today’s IT admins are interested in a more holistic view of how a single identity can connect users to all the IT resources they need. That holistic view of identity management has been called unified access management by some. The initial view of unified access management had been to connect users to web applications and legacy, on-prem applications, but, IT admins are now realizing that this view is somewhat narrow. Today’s end users are accessing far more than just applications. Their systems (Windows®, Mac®, and Linux®) are critical. Cloud and on-prem server infrastructure is more important than ever and being driven by the likes of AWS® and Google Cloud Platform™ (GCP). The email infrastructure is no longer Microsoft Exchange®, but rather G Suite™ and Office 365™. WiFi networks are the norm, and data storage is in new file servers such as G Drive, Box™, NAS appliances, and Samba file servers. All of these new types of IT resources are being leveraged by end users every day, and IT admins are obviously interested in controlling access to them. The challenge for IT organizations is that, as we said earlier, traditional solutions such as Microsoft Active Directory and web application SSO solutions struggle to handle the wide range and types of IT resources. The good news is that there is a new generation of cloud identity management platforms that does this, and includes unified access management for web applications as well. Called JumpCloud® Directory-as-a-Service®, this cloud identity provider is securely managing and connecting IT resources to the systems, applications, files, and networks that end users need. JumpCloud leverages something called True Single Sign-on™ (SSO), which is very aptly named. With True SSO, users in an IT environment can use their individual identity to log in to all of their IT resources, both on-prem and remotely via a web browser console. As long as they are integrated into JumpCloud Directory-as-a-Service, end users are connected, secure, and backed by multi-factor authentication (MFA or 2FA) on Mac and Linux. See how JumpCloud Directory-as-a-Service can be used for unified access management for web applications firsthand by scheduling a demo of the product. You can also sign up for JumpCloud absolutely free, with your first ten users on us. Feel free to contact our support team if you have any questions or comments.